Does the thought of placing your hands near your cat’s mouth in an attempt to brush their teeth, conjure up images of..
As a cat owner myself, I must admit, my new feisty, funny (and slightly mad-eyed) two year old moggy doesn’t immediately give me the impression that I’d be welcome rummaging around in his mouth. BUT there are proven tips and hints that do work and are effective at keeping your cat’s teeth and gums healthy and pain free. It’s also a fact that infections in the mouth can affect other organs within the body so it is important to pay attention to cat’s oral hygiene. For those reasons alone, I’m willing to give it a go and gently start to build up contact with my cat’s mouth with the aim to providing regular cleaning services. Let’s take a look at some of the advice and tips on how to clean your cat’s teeth and develop and practice a good, regular oral hygiene brushing routine with your perfect pud. Take it slowly – there’s no need to rush, ultimately you’re aiming for a stress-free time for both of you. Start by making the touching of their mouth something familiar and that they look forward to – Settle down somewhere comfortable, then calling your cat in a tone that suggests “treat/food”, let your cat lick a treat off your finger. Try to gently rub one or two teeth or gums at the same time. Build this approah up slowly and after a few sessions, your cat should start to look forward to this and you can move up to the next stage. Arm yourself with bespoke products – There are specific toothbrushes for cats, featuring soft bristles and shaped to fit their mouths better. Some are designed as pop-on finger brushes, and there are also smaller versions for kittens too. To help the job be that much easier, specific cat toothpastes* are not only made out of all the correct ingredients, designed for cats, they are flavoured too, which will help entice and encourage your cat to allow you to touch their teeth. *NEVER use human toothpastes or mouth rinses on your cat as they contain unsuitable ingredients which are not designed to be swallowed and they are unable to spit out. Begin brushing the outside of the top set of teeth – always brush down away from the gums so that any food items are pushed out of the mouth. Repeat on the bottom jawline – brushing up away from the lower gum line. Gradually increase the number of teeth brushed – you may only be able to do a couple of front teeth at first. Once your cat relaxes and looks forward to the tasty cat toothpaste, you can add more teeth into your routine. No need to rinse – the pet toothpaste is designed to be eaten. Simply ensure your cat has access to fresh water afterwards. 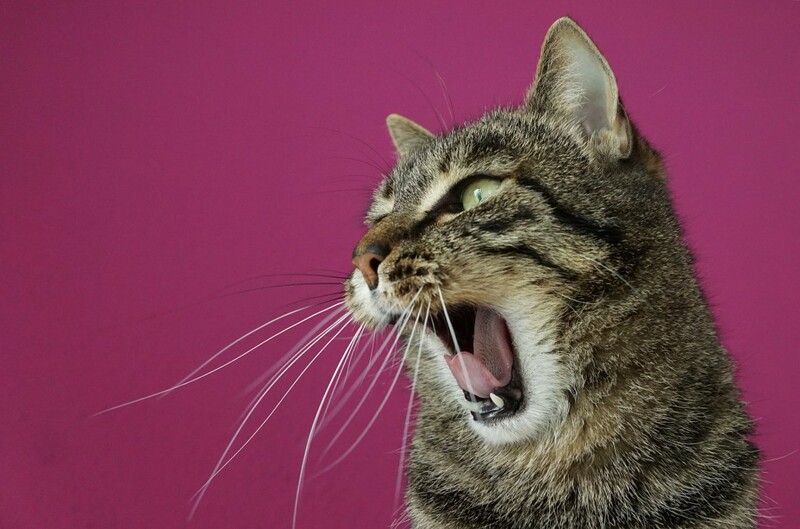 Although it’s recommended you clean your cat’s teeth daily, even twice a week will cut down bacteria. If you have a kitten, start as early as possible using kitten-sized brushes. Are you going to try a regular cat tooth-brushing routine? Why not add comments to our blog, sharing your tips and hints or let us know how it’s going! I’ll update you on my own progress over the coming weeks.